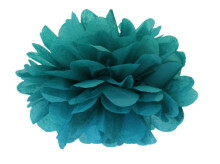 Paper PomPoms are beautiful addition to any party, shower or wedding! Mix and match colors and sizes to create a gorgeous display. Please note, these paper poms are handmade and colors may vary slightly between sizes. Instructions for the poms: Start separating the layers of paper one at a time, away from the center, very gently. Tissue paper is very delicate and can easily tear. Continue to separate the layers until you have created half of the ball shape. Flip over and continue separating the other side to complete the full ball shape. Fluff as needed.